After spending more time in California, the bar has definitely been raised on what a park should offer. 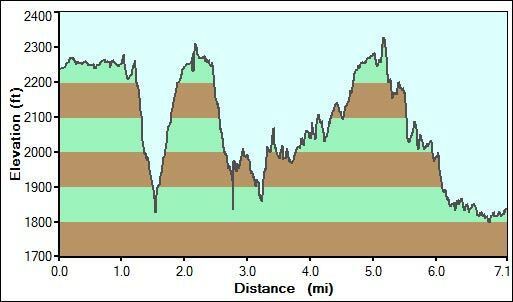 It has to include some difficult sections (read, vertical) and several miles of scenic hiking. 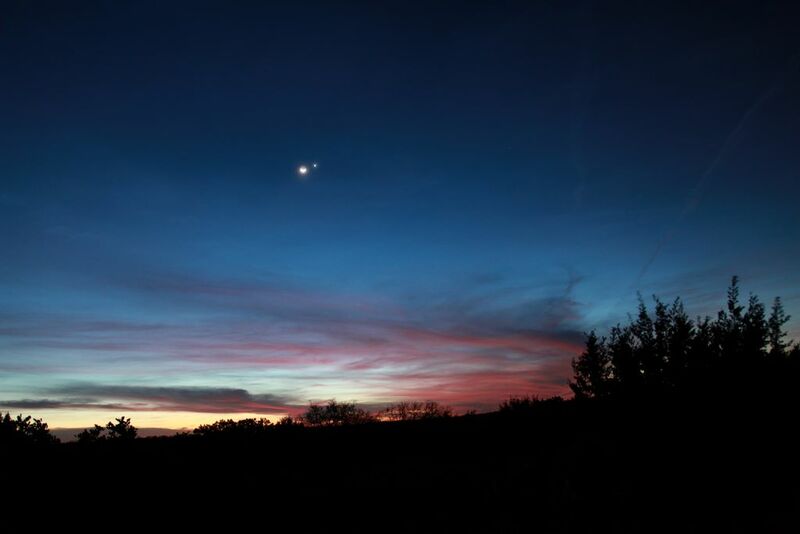 While there are some great options out in west Texas, the options are fewer near Austin. 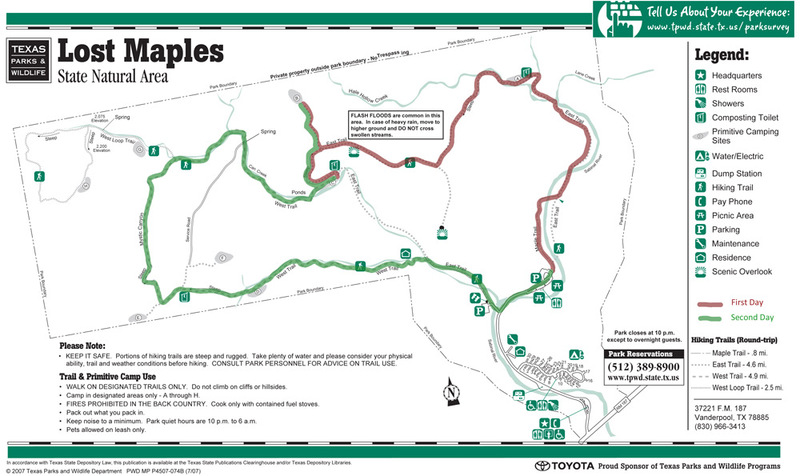 That said, Lost Maples is one of my favorite parks in Texas. It has natural beauty with crystal clear spring fed ponds, waterfalls, caves, and vertical elevation that allows you to see the ponds from high above. This trip, we talked my buddy Thomas into coming along. 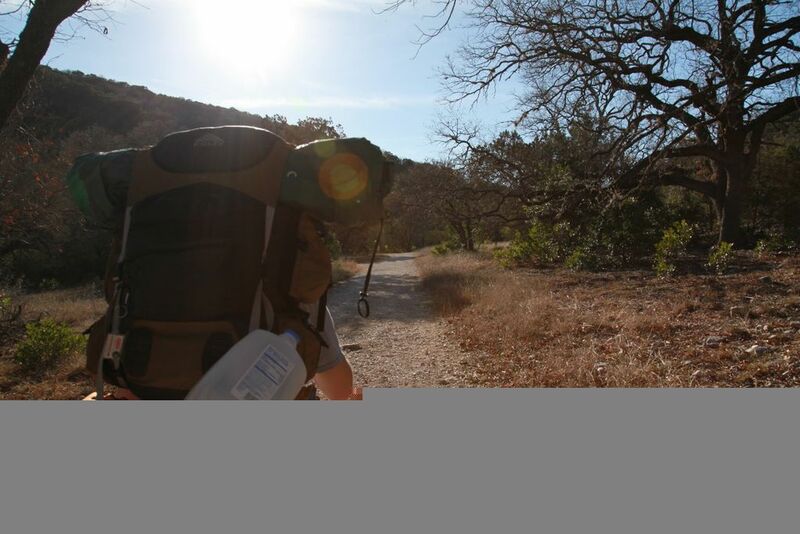 The trip offered him an excuse to dust off some of his old gear and hit the trails with us. 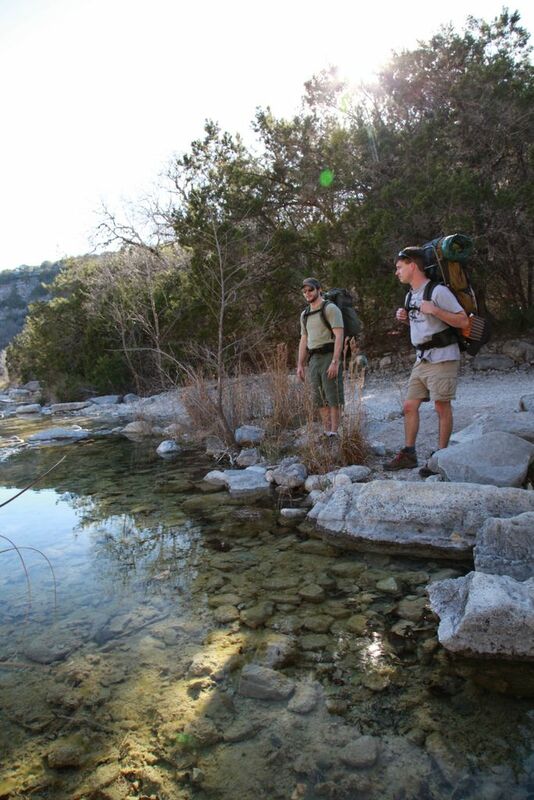 So that's us, heading out on Friday towards Lost Maples. In typical fashion, we got going later than expected (had to stop by Cabella's and buy overpriced items) but made it to the park around 3pm. Once in the park, we parked in the east parking lot and started our two mile trek to Campsite A via the Maple/East Trail. Along the way, we enjoyed the crystal clear water with miniature waterfalls dotting the stream. The water level was low but still flowing. It was still winterish, so there were lots of gloomy looking trees and brown. Clearly this is not the most scenic time to visit the park. Once we arrived at Campsite A (where we camped on the previous trip), we dropped our gear, Dale went to relieve himself when he nearly pissed on some guy's just out-of-site campsite. Oops! After a quick discussion, we decided there was enough time to keep going and find an isolated site. So our new target was Campsite B, which posed some problems of it's own. Since B is dry and the nearest water was 400 feet below it, we either needed to hike in water now, or set up camp and make an extra trip for the water. We went with the second option. The hike between sites A and B represents some of the tougher terrain the park has to offer (as indicated by the sign), but I would still say it was a moderate hike. As you ascend, you do get some nice views along the way. 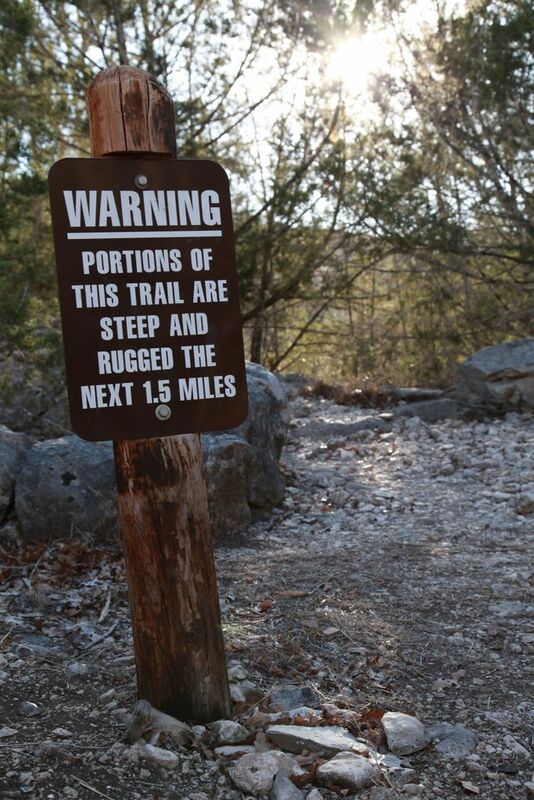 Once at the top, it is a fairly uneventful hike to the split for B with the exception of the scenic outlook. From this vantage point, you can see the ponds, Campsite C and the hill country. We would be back later to watch the sunset and smoke a cigar. As we headed to B to find a spot and set up camp, we came across a longhorn grazing. I think he was lost but didn't seem too concerned. Just to play it safe though, we camped a bit away from him. After getting everything set up, we were surprised to see another group of kids come through also looking to camp at B. We figured the lack of water would keep people away but that was a bad assumption. They filed past us heading towards the longhorn. We figured it would work itself and decided it was time to get some water. We descended along the trail, enjoying not having a backpack for a change, to the pond. Once there, we sat along the banks and enjoyed the evening for a while. Then it was time to haul the water back to camp and get some grub. What we didn't realize when we were setting up camp is that we were doing so in a wind turbine. A couple of hours after we crashed, the wind picked up quite a bit. At some points, the tent was literally folding over the top of my face. It made it interesting but difficult to sleep. I tried to shrug it off and keep sleeping. In the morning, the temperatures had dropped quite a bit so we added some additional layers. We packed up and hiked down to the pond. The previous day, we spotted some caves so now that we had better lighting, we decided to do some spelunking. It was surprisingly difficult to find the caves. Once we got up on the side of the hill, we couldn't spot them anymore. Thomas actually had to walk back down to the bottom to do some spotting for us. With his help though, we finally found what we were looking for. 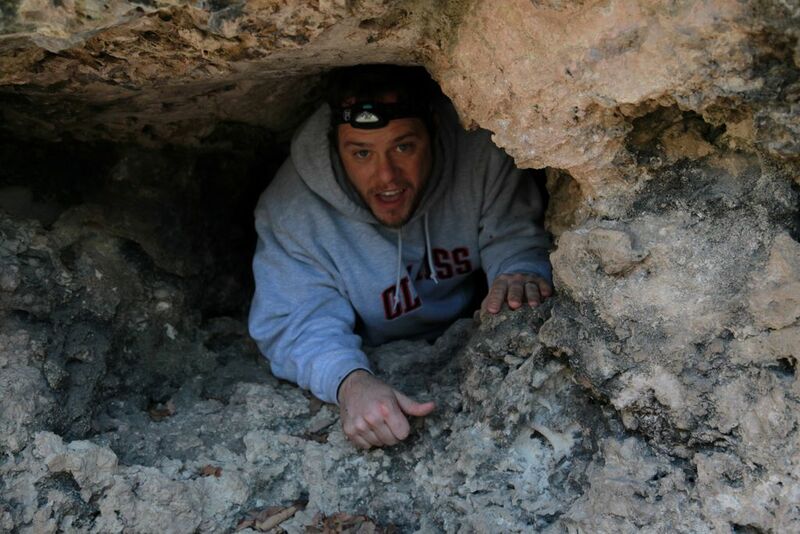 There was a string of small caves with the largest being about 8x8x4. Others gave you enough room to squeeze just yourself into. A bit spooky, but fun. Once done with the caves, we continued along the West trail towards the spring. When we were here the previous summer, it was nice and hot and the spring was perfect for cooling off. This go round, there would be no getting in the spring. Namely because it was cold, but also because once we arrived at the spring, it was not much more than a trickle. Oh well, we still decided to relax in the area and enjoy some snacks. After our break, we continued along the West trail with more of the same scenery as the rest of the park, just with less water. We complete the hike in a couple of hours and we were off headed home.